One of the best knives that I have ever owned would definitely have to be the CRKT Ag Russell Sting. The Steel features some of the toughest steel out there and you can definitely be confident that this knife is not going to break easily meaning it can really handle the toughest of jobs. CRKT really do make brilliant knives and that is clearly evidenced by the AG Russell as it is one the best fixed blade knives currently out there for its price and definitely one I recommend you add to your collection if you are serious about knife quality. 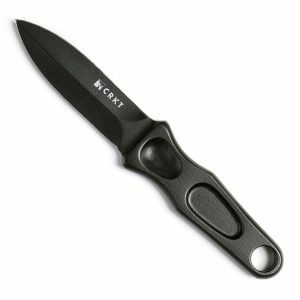 The CRKT AG Russell knife features a top quality blade that can handle most tasks you put in front of it. It can be used for cutting meat and preparing food, to every day utility needs such as cutting rope and opening boxes. 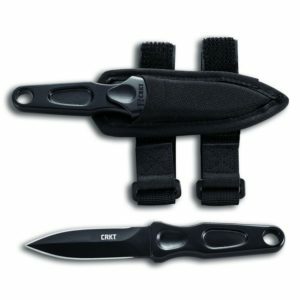 This knife can do it all and that is one of the selling points made by CRKT. The CRKT AG Russell is made out of high quality 1055 steel, which may not be my preferred steel or as good as quality as D2 tool steel or S30V, but it still gets the job done. The knife keeps an edge surprising well for a fixed blade knife meaning you don’t have to waste all your time sharpening the damn thing. Now I couldn’t really get it face shaving sharp as I would have liked to but you can still get a super sharp razor edge with this knife and for the price, I am not complaining. Like I said earlier, this is some tough steel so you can rest assured knowing that even placed under huge amounts of pressure and stress that it isn’t going to break or chip, making it perfect for a lot of heavy duty jobs. 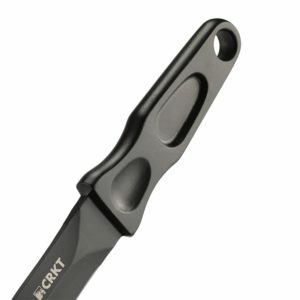 The CRKT features a fairly unique handle, as you can probably notice that it doesn’t feature any sort grip and rather features an integrated handle. What this means is that the handle is essentially a part of the blade which I find gives you a really solid grip on the blade and makes it extremely versatile. My only complaint about this is that since it isn’t wrapped in anything, then it feels kind of small and as I have pretty big hands it is hard to get a solid grip. However, as I am in the minority, I didn’t take any points away for this because this is really only going to affect big people like me. The knife comes with straps which then allow you to wear it as a boot knife but you are able to remove these and carry it on your belt if that is something that you would prefer. As it is moderately lightweight, it isn’t going to weigh you down or be a burden on your side as some of the other heavier fixed blade knives out there are. Overall, the CRKT AG Russell is one hell of a fixed blade knife. But if you don’t believe me, go and check out the over 100+ five star reviews on Amazon. However, like I mentioned before about the handle I recommend that if you go and get a feel for it at your local knife store before you buy it just to make sure that it is right for you.